Here you will find modules written and/or edited by myself. Hopefully you will find something here of use in your game. As a sign of my faith in myself (or perhaps it's just foolishness), I am listing both modules currently available as well as those that are still just maps and loosely organized plans. All downloads are PDF files; you'll need Adobe Acrobat reader (or a compatible program) to use them. As of right now, the modules GL2 through GL5, below, will not appear as indicated. 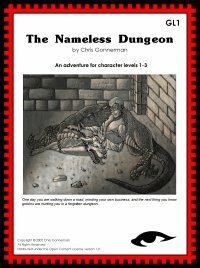 I'm now writing them for my new project, Basic Fantasy Role-Playing Game. Look for more information on that site! The old tower on the hill is haunted, or so they say, but you don't believe it. On a dare you've agreed to spend the night. Will your opinion change before daybreak? 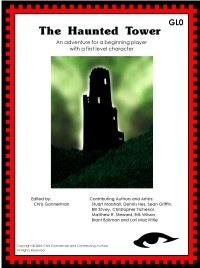 An adventure for one or more beginning players with first-level characters. 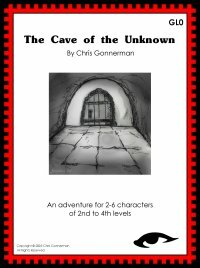 In a dangerous area near the borderlands lies a cave. Some say it's just an orc lair, but others believe it to be a portal to the underworld. Have you the courage to find out? The valley of Freestead was once green and pleasant, and the humans and dwarves who lived there revered their leader, Duke Vadarin. He was betrothed to the beautiful Lady Kylenne the Courageous, who arrived in Freestead on the back of a white dragon. On the day before their wedding, an explosion engulfed the Palace, and almost overnight the kingdom fell into ruin. The proud Serenhai people were ruled long ago by a seemingly immortal hero, Karsma Megalos. He disappeared in the Cataclysm, and not long after his people were defeated by armies from the north. No one knew where the hero was buried... until now.